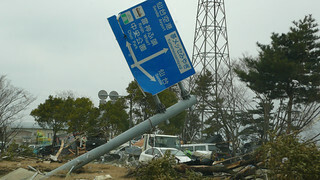 The aftermath of a 2011 tsunami off the coast of Japan that resulted in massive destruction. In 2011, a tsunami off the coast of Japan resulted in the death of thousands and massive destruction. Last year, our town of Newport, Oregon felt the impact of this event when debris from the tsunami began arriving on our shores. 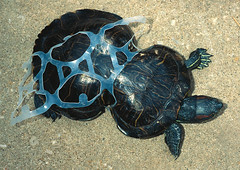 The impact of invasive species, debris, and chemical products is not yet fully known. Our students worked together to investigate the impact of tsunami debris, ultimately creating educational materials to inform community members about this important issue. 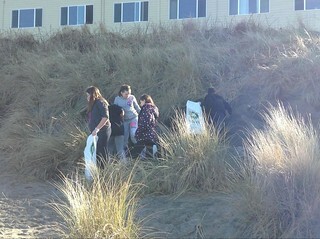 Early in the project, we participated in a community beach clean-up to help with the removal of debris. 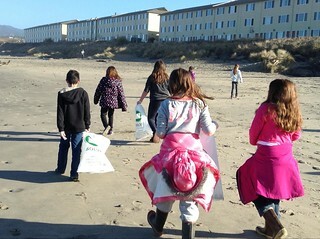 Students work together to clean up Japanese tsunami debris washed ashore the Oregon coast. Throughout the project, students worked with a variety of groups, gaining unique viewpoints to more fully understand the impact of this disaster. Interviews with tsunami survivors, Japanese biologists, local biologists, a Siletz tribal member, and a local business owner helped the students gain multiple perspectives on the issue. Each of these perspectives provided students with different insight into the impact of the tsunami, and demonstrated the global impact such an event has. Students took their new information and the experiences they were able to be a part of, to contact Japanese students and invite them to participate in a joint beach clean-up or a day at the beach via a written letter. Next, students created informative posters to share with parents and other adults attending our school’s literacy night. Here, people were exposed to information that 4th grade students put together, as well as invited to be interviewed on video to questions pertaining tsunami debris and beach pollution. Students shared informative posters with parents and other adults attending the school’s literacy night. Finally, our students put together a plan for creating a movie that shares our experiences-- the interviews and clean-ups we participated in-- in the hopes of educating the public on this issue. Our goal is to post this video to our district web page to be viewed by our larger community. Each class worked on a video collaboratively. Here, we describe our personal journey with each class. “Wow! What an amazing experience this was. It was definitely full of trials, frustration, technology restrictions, but also full of perseverance, creativity, and passion from the kids. I feel that when students were at the last step of production with their Story Creator videos, they put a lot of seriousness in the topic. I have never seen so many students work together effectively as a team to produce a final piece. The Importance of Perspective: This scene describes how each perspective we met during our beach clean-up, as well as our own personal perspectives on tsunamis and beach pollution are different. What might be considered a trivial problem to some, is a huge deal to others. For example, playing at the beach is huge for us Newporters, but many Japanese students often don’t feel the same since the tsunami hit their country. We definitely faced a few challenges: primarily time and technology limitations. Our first challenge was being able to plan time to complete our beach clean-up and work on some in-class posters, research, and movie planning. Our statewide testing took up a lot of time in our daily schedules, but we managed to adapt our schedule whenever possible. A second challenge we faced is how to use our new technology to our advantage. Students had limited time to explore using ipads, and once we used them we spent a lot of time trying to figure out how to make each part of our movie, and then somehow put it all together. It was definitely a learning process and assuredly brought upon frustrations. Now that our project has come to an end, the most frustrating challenge we encountered was the limitations we had to produce and create videos on the ipads. Each team had to produce a movie, which ended up being more like a book about a scene related to our beach pollution and tsunami debris project. 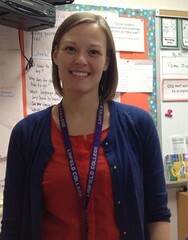 This was a pilot test of using iPads in Lincoln County classrooms. The process for getting apps on student iPads was time-consuming and out of our hands, so we were restricted to using a specific set of apps. We felt that with a better app for movie making, our students would have had more publishing and sharing power. 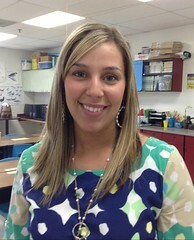 "Though we faced challenges with technology, this experience has allowed me to be challenged as a teacher. I have grown up in the education system where one answer was always what we were looking for. Throughout this SEAL opportunity, I have learned how to work through something and get a product at the end, that was different than others. I have begun to use this “aha” moment in my teaching with my students. I am giving them more choice in their learning, specifically when it comes to what they feel they need to work on in math for example, and I am also providing opportunities for my students to engage in problems with several correct solutions. They reacted as I did the first time...frustrated. 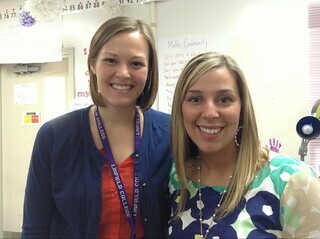 BUT... they have come a long ways since Project SEAL began, and I hope to carry this on into my second year of teaching next year." Our students live in an area where a tsunami is a threat. 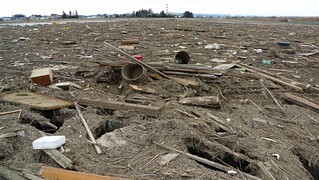 They know about the Japan tsunami and have seen the washed up debris. This was a great opportunity for our students to help implement ideas for what we could do in a tsunami, and understand the tsunami’s effects on other people and other parts of the world. 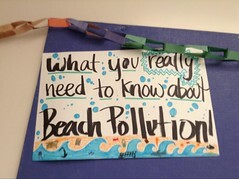 This experience has also increased student empathy for their coastal beaches, due to the effects of trash, pollution, and tsunami debris washed upon our shores.